The first book I tackled while on holiday was Golding’s “Close Quarters”. In fact it was a second reading for I was not really satisfied with my first review and I felt I had to go back to CQ for a better comprehension of its content, especially before tackling the last part of the trilogy “Fire down below”. “This voyage will be the making of you, Mr. Talbot” prophesizes one of the ship’s officers and so it is. We witness in the 17 chapters of the book (of which only one bears a title) the further development of our friend, young Edmund Talbot. We are still on the un – named ship on which Talbot and his fellow passengers, crew and immigrants, hope to reach Australia on the other side of the world. The ship has freed itself from the calms and the heat of the doldrums in the middle of the Atlantic, and is now making way south to reach the prevailing east – ward winds. On rereading CQ, I discern now three identifiable parts, each a stage in our hero’s development and understanding of the world around him. As Talbot celebrates his birthday on page one, I think Golding hints at this “development” structure. In each part Edmund Talbot has to confront new feelings and take emotional hurdles which will lead ultimately, we hope, to responsible adulthood. Part one takes about 5 chapters and I would label it ironically “Courage under fire”. Indeed Talbot has to prove and does valiantly prove his courage in two incidents that badly shake the community on board of the old warship. First there is the incident whereby the boat gets severely damaged when taken aback, an incident caused by a grave neglect of responsibility by Lieutenant Deverel who has left his watch to have a drink. The incident is important as it sets in motion the final destruction of the old ship which is now literally falling apart after “one blow too many”. Also the conflict between Captain Anderson and Lieutenant Deverel starts now to build up towards its climax and thirdly Talbot gets in that incident an opportunity to show that in a crisis he has the right attitude, even though it is to no avail and he gets seriously knocked for his intention. The second happening in which Talbot can prove his courage is the appearance of a threatening sail at the horizon and everybody, passengers included, prepare for the battle. Here too Talbot, although seriously damaged in previous incidents, shows his courage by putting himself on the first row of the “entering – party”. Edmund has really become more of a man during this voyage. In the first book “Rites of passage”, Talbot could still be (mis-)used by Captain Anderson in a cover-up scheme but this time he courageously stands up to him. When the Captain orders that he should be a witness in an incident with Deverel, Talbot refuses with a: “I do not wish to interfere in a service matter” – rebuke. Edmund has clearly learnt his lesson. The Second distinctive part of the book, which I would call “ Love and Passion” starts with the exceptionally titled chapter six “The great day”, which sees Edmund fall in love “head over heels” with lovely Marion Chumley, a passenger on the other boat. With Love come all the undesirable by-effects: passion, (self) doubt, jealousy, suspicion and separation. The amorous behavior of Edmund makes up for the funniest scenes of the book. So “madly” is young Talbot in Love that he has to be dragged away and locked up in his hutch to protect himself against his uncontrollable passion. This part ends with the “she is gone” end-phrase of chapter eight but unhappily lingers trough the next two chapters. The third and more difficult part is tricky to label. It could be called “Truth and Responsibility”, but too much happens to label it accurately at this point of my reading of the trilogy. It starts off with a “descent in to Hell” in chapter eleven and end runs until the end of the book. Two things trigger this haunted last part of the book: Edmund has moved into the “cursed” hutch of the late reverend Colley and Wheeler, the servant of Talbot, who fell over board in the previous book, reappears, like a real “revenant”, a ghost back from the underworld! Talbot flees deeper into the boat, and finds Jones, the mysterious purser, who makes it clear that if the boat will sink, and there being not enough life-rafts, it will not be woman and children first, but the fittest who will make it. Jones, to the astonishment of Talbot even develops the idea: not only the physically fit but also those who like himself have financially secured a “life-insurance”. Money can buy you security, also far out at sea. Finally Talbot arrives at the central spot of the boat, where she endures the least movement and where the chronometers are kept. He finds there Lt Benét and the first Lt Charles Summers who are debating the question of the boat’s safety and the measures to take to reach Australia before the ship goes to pieces. Summers and Benét are becoming more and more competitors to each other. Summers is a more conservative experienced sea-dog, while Benét, the dashing young risk taker, with the blessing of the Captain, advocates a risky drag rope action to clean the hull and gain some speed. This action is not without risk, especially in open sea. (Pieces of the old boat might be scraped off together with the encrusted weed or coral). Edmund Talbot, his head spinning with all the “Truth’s” he has heard, flees back to the safety of the deck. In a dramatic finale of the book: three, nearly simultaneous “coup de theatre”, happen. All three are of major importance to our hero but I will not spoil them for you. There is a possible sighting of a Sea-Monster, a ghastly suicide, and a reconciliation with an old friend. Typically Golding, these occurrences stir up more new questions than that they bring answers. But as the reader knows, we are not yet in Australia and the final book of the trilogy has yet to come. The second element that accounts for a more uncanny feeling throughout the novel is the return of that creepy figure Wheeler, or is it Wheeler’s ghost, which is back. Talbot’s lost servant has come back from the world of the death! For really, one cannot imagine how someone who is washed overboard can accidently be picked up by another ship in the middle of the ocean. Says Talbot addressing his spectral servant: “You was a lucky dog, you know. It must have been a chance in a million! It would be proper to give thanks, you know”. Then as if blasphemy was just spoken: “An extraordinary shudder shook the man from head to foot”. Wheeler does later confess “I am in Hell Sir” and seems to be even more afraid than before. He sticks to Talbot, haunting him like a shadow and keeping close to the evil hutch in which Colley died earlier. Although he explains hesitatingly to Talbot, that he just slipped and fell overboard he explains later that the crew bears him a grudge for revealing some matters in the Colley affaire. Talbot forces him to confess what exactly happened to Colley, but we are not informed for says Talbot: “the information was of such a nature that I do not propose to commit it to this journal”. Once more a truly good book: easy to read, a fascinating recreation of a fictive world and food for thought served as a six course meal. A sure recommendation! 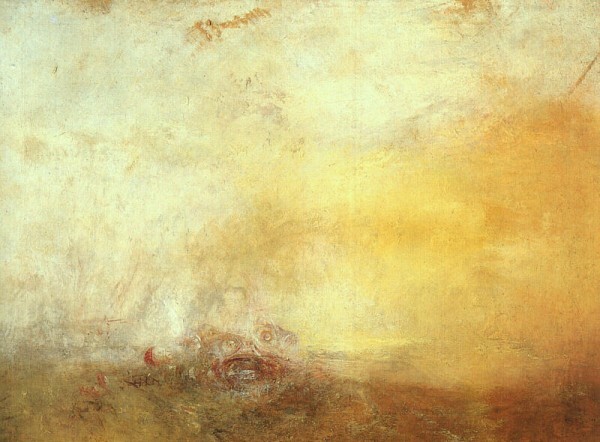 We have already commented that the "dissolution of the forms" present in Turner's last works was interpreted by numerous critics as the beginning of a dementia. Even Ruskin himself was quite disturbed by these works by Turner, who was sometimes forced to place nails in the frames to indicate the top and the bottom part of the canvas. The (1845, London , Tate Gallery) is one of the best examples of this last epoch. The forms of the sea monsters are hardly recognizable in the middle of the omnipresent marine atmosphere. The almost divine quality of the light reflects Turner's theory of considering the Sun as the centre of all life.